Modulo di ricerca nel sito: inserisci le parole chiave nella casella di ricerca per trovare il contenuto desiderato. (Turin 1820 – Rome 1878). King of Sardinia from 1849 to 1861 and King of Italy from 1861 to 1878 he was the son and successor or Carlo Alberto. He acceded to the throne at a time of great difficulty for the State and the House of Savoy. He suffered defeat at Novara (23 III 1849) and the radicalisation of political passions: the Chamber of Deputies refused to approve the Peace Treaty of Milan. Vittorio Emanuele II upheld the Constitution, dissolved the Chamber and with a clear misrepresentation of the will of the electorate (proclamation of Moncalieri, 20 XI 1849) managed to see a parliament elected with a moderate majority. He did not oppose the clearly anti-ecclesiastical Siccardi laws, approved during the premiership of D’Azeglio (1849- 1852). He then began a long period of collaboration with the new Council president Camillo Cavour which saw involvement in the Crimean War (1855) and efforts to forge an alliance with Napoleon III’s France against Austria. 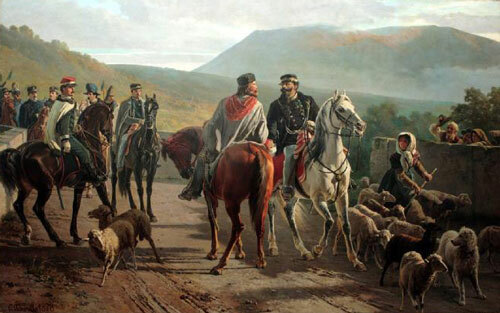 Victory in the Second War of Independence was the most significant point in this policy that enabled Savoy’s Piedmont to gain Lombardy (Villafranca armistice, 11 VII 1859). Against Cavour’s advice, he secretly supported the Expedition of the Thousand. Having ceded Nice and Savoy to France and annexed the central a southern regions of the peninsula, he was proclaimed King of Italy (17 III 1861). After obtaining Venetia in the war of 1866, he took advantage of the Franco-Prussian War (1870) to wrest Rome from the Pope (20 IX 1870) and complete the unification of Italy.